You can build a basic TOFFEE WAN Optimization hardware completely in software layer (i.e its networking data-plane and control-plane). And if you are a product manufacturer you can make commercial WAN Optimization products with TOFFEE with software layer alone. And if you choose to improve its performance, you can use any third-party PCIe Compression Accelerator cards. 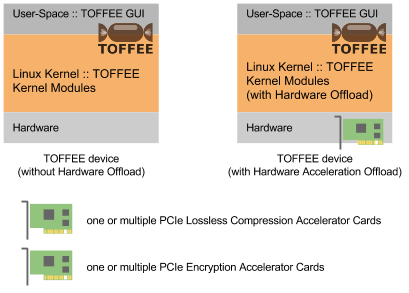 Here is the TOFFEE system architecture with and without hardware accelerator card (i.e Hardware offload). Hardware offload will greatly reduce the load on general purpose CPU (which is your software/OS layer) and the core data optimization operation such as loss-less compression (sometimes even encryption) is done within a dedicated Hardware Accelerator card (or chip) as shown below. In this case TOFFEE will work as an WAN Optimization framework. With this framework you can architect your entire commercial WAN Optimization product series. You need to modify TOFFEE Linux kernel modules (and APIs) so that it no longer choose kernel's LZ77, LZO or LZ4 software compression libraries (which is CPU bound), instead point to the hardware accelerator card vendor provided kernel's driver/library APIs. This makes packet data compression within TOFFEE Linux Kernel module CPU bound to dedicated co-processor hardware compression accelerator card bound. It is a well known fact that Linux Kernel's Kernel modules are not great at scaling with multiple CPU Processor Cores. So in a systems architecture point of having more CPU cores in a TOFFEE WAN Optimization device gives no significant advantage. The per-core CPU performance is what required for a workload like TOFFEE packet data optimization. So if architect a high-end WAN Optimization device you need to consider hardware acceleration offload if feasible. For example: Here is a general purpose AHA AHA363PCIE0301G 5Gbs GZIP Compression/Decompression Accelerator Card. Typical applications (or use-cases) of this card could be Storage Arrays, Load Balancers, WAN Optimization, Web Servers, Data Analytics, etc.